You’ve probably heard it a thousand times by now. The average order value of an email is at least 3 times higher than that of social media. Email marketing has the highest conversion rate (66%) when it comes to purchases made as a result of receiving a marketing message (when compare with social, direct mail, and other methods). Data aside, email marketing makes sense for business because it allows you to build a better connection with your subscribers. On top of that, there’s no middleman when you’re emailing, and you own your email list. Compare that with social media, where an algorithm change could have a devastating effect on your engagement, and it’s easy to understand why email marketing is essential. But, as with any marketing tactic, you have to approach building your email list with a clear strategy in mind if you want amazing results. Let’s look at a few of the best email list growth strategies for small businesses. Offer incentives in your blog content. An opt-in call-to-action like “Sign up for updates” isn’t going to skyrocket your email list growth. It’s too vague and doesn’t state a clear benefit for the user. So, how can you make signing up for your email list irresistible? One of the best email list growth strategies is to offer free incentives within your blog content. These incentives should be made available to download in exchange for the customer’s email address. But don’t just throw the same incentive in every blog post. To get the most from this strategy, to make the incentive closely related to the blog post topic. That way, you know that anyone who reads the post is likely to be interested in downloading the incentive too! It makes perfect sense for the blog post’s audience because it allows them to take action on what they learned from reading the blog post. So every time you create an opt-in incentive, try to offer something that allows your readers to take action on what they learned or learn even more about the same topic. Because increasing your email sign-ups in a big way is all about offering your target audience something they can’t resist. Use email list building tools. There are tons of tools out there that can help you build an email list, regardless of your budget, technical ability, or the industry you’re in. Let’s talk about a few of your options, starting with one of my favorites: HelloBar. HelloBar places a small bar across the top of your website. Within the bar, you can include a call-to-action that entices people to sign up for your email list. You can see that they used the HelloBar to advertise their opt-in incentive – a free eBook. But you could ask people to subscribe to your newsletter, send them to a landing page, or ask them to take some other action – it’s up to you. If you’re looking for something a little more robust, consider Opt-in Monster. Not only does it offer floating bars similar to HelloBar – it allows you to create sidebar forms, pop-ups, and more. Now, let’s talk about one more option: Leadpages. 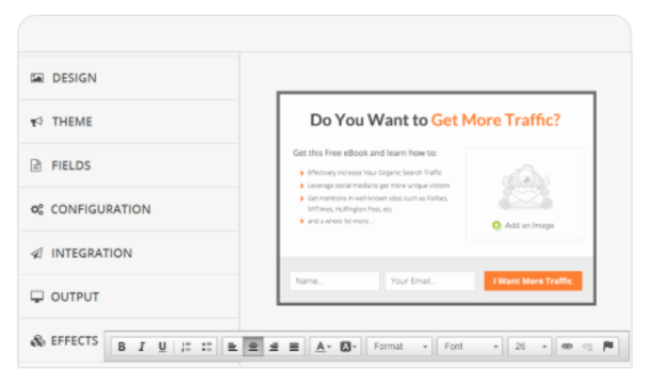 This is one of my favorite tools for creating landing pages. 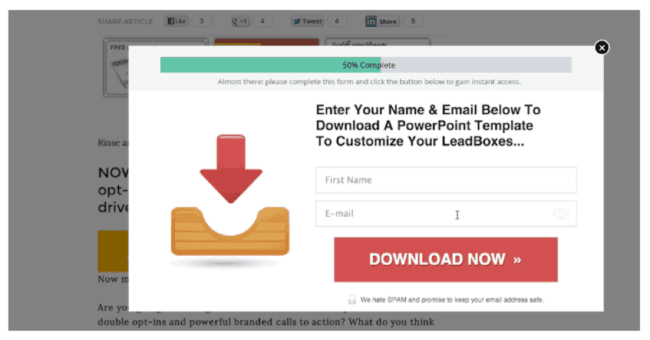 You can also use it to build LeadBoxes, which are small pop-up boxes designed specifically with conversion in mind. This is a great way to offer your opt-in incentives in exchange for an email address, and you can use it as a linked pop-up or a timed pop-up depending on your preferences. Tip: Want to learn about even more tools you can use to build your list? Check out this KISSMetrics list – it includes 67 of them! If you’re not familiar with webinars, they’re simply seminars conducted over the internet. You ask people to sign up with their email address, and just like that, you’ve got a new lead. When you host a webinar, make sure you’re ready to offer your target audience valuable information. Seriously – you want the topic to be so relevant that they can’t help but sign up. 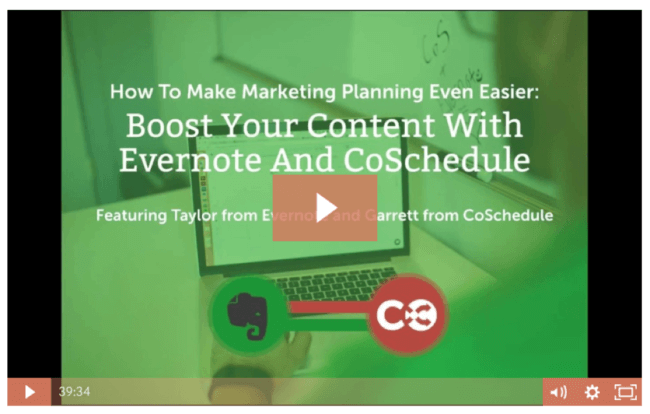 Because CoSchedule is a marketing calendar provider, they picked a “marketing planning” topic they knew their audience would likely be interested in learning about. And they were right. 566 subscribers attended that webinar. Wondering what kind of results this tactic might produce for your business? Marketing software company Hubspot used this strategy to draw in 25,000 sign-ups, 3,500 of which were totally new leads. So consider using webinars as part of your marketing strategy. Not only will you be able to grow your list – you’ll build trust with your potential customers by positioning yourself as the authority on your chosen topic. Regardless of which of these email list growth strategies you choose, you can’t think of building your list as a marketing strategy on its own. Instead, think of it as one piece of your overall marketing strategy. For example, if you’re offering an opt-in incentive, you have to promote it – whether that’s on social media, in your blog posts, or elsewhere. And if you’re using a tool to create a pop-up, you better make sure you create the pop-up with your target audience in mind. Because the truth is, while the methods in this post could skyrocket your list, they might not work at all. Success with list building is all about the strategy behind the tactics and how you implement them. Which email list growth strategies are you going to try? Share in the comments section below!